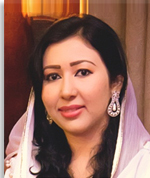 Hira Aftabis serving IBIT, PU, as Lecturer Finance since August 2011. In 2016, she has obtained International Australian scholarship for PhD in the area of “Financial Econometrics”from“James Cook University, Australia”. The Times Higher Education (THE) World University Rankings2016, placed JCU in the top 200 of the world’s universities.She has secured Masters’ degree (MBIT) in the area of Finance, with Gold Medal from IBIT, PU in 2011 andcompleted her BBIT (Hons) with finance majors from IBIT, PU in 2009. During her study, she earned merit scholarships based on obtaining high CGPA. She is a member of Finance forum of American Research institute (AARI Membership ID: FIN-AAIR-1013). During her stay at IBIT she has ensured 11 research papers in recognized international journals (both X and Y category) including European Journal of Scientific Research, Journal of Basic and Applied Scientific Research, Science International, Middle-East Journal of Scientific Research, International Journal of Business and Social Science , American Journal of Scientific Research and many other. She managed to teach Business Finance, Advance Financial management, Principles of Accounting, Macroeconomics, Microeconomics, Financial Econometrics and Corporate Finance courses at IBIT, PU. Her areas of interest arefinancial markets, financial crises, Portfolio management, Asset diversification strategies and financial asset’s return analysis. Her academics, Gold Medal in MBIT followed by Top Position in BBIT, and professional career, are a strong evidence of her focused work, target orientedefforts and high research capabilities.